For precise control, great safety features and a real touch of luxury in your shower, choose the GROHE Grohtherm 3000 Cosmopolitan comfort shower set with concealed thermostat. The temperature is easy to set with the elegant circular handles and the intuitive GROHE EasyLogic scale ring, while the GROHE AquaDimmer controls water volume with precision. GROHE TurboStat technology will ensure the selected temperature stays constant for the duration. The GROHE Rainshower Cosmopolitan 160 head shower and GROHE Euphoria hand shower both offer the relaxing and soothing Rain Spray for a shower that gives you that spa-like feeling of wellbeing. GROHE DreamSpray technology ensures and even flow from every nozzle. To prevent the build-up of limescale, the SpeedClean silicone nozzles can be cleaned easily with a soft cloth. Great for families, the GROHE SafeStop system offers a temperature limit preset at 38°C to prevent scalding. 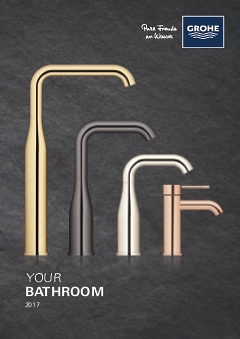 The dazzling GROHE Starlight stainless steel finish is scratch-resistant for a pristine look for years to come.